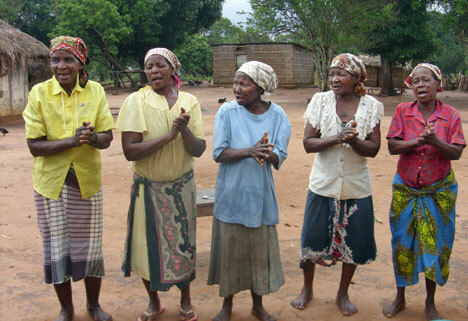 Residents of the United Methodist-run home for widows in Massinga, Mozambique, greet visitors. The home provides food, clothing, shelter and community for 26 women abandoned by their families after their husbands have died. Juaneta (left) is the elected leader of the community. A UMNS photo by M. Garlinda Burton. Some of the widows were run out of town as their neighbors threw stones. Others, considered too great a financial burden, were left on the side of the road to die. Still other widows were branded as “witches,” and deserted by their children. These are the stories of 26 women who are rebuilding their lives, thanks to United Methodist women in Mozambique. The widows’ home in Massinga has become a haven for widows abandoned by their families and threatened by neighbors as being “bad luck,” or costing too much to support, says the Rev. 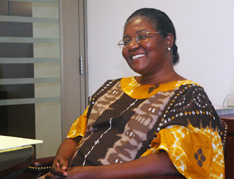 Victoria Chifene, executive director of women’s work in the Mozambique South Annual Conference. The ministry started when two or three women were discovered living in fields around a United Methodist church. The district superintendent brought the women to his home. His wife, Irminda Xavier, rallied support from neighbors, friends and the office for United Methodist women in Mozambique. Today, the women live together in makeshift homes on the church’s district property, fed and clothed via a line-item budget in the conference office. The widows grow much of their own food. A UMNS file photo by Chris Heckert, GBGM. On a recent day, they harvest cassava root as neighborhood children help grind the grain and local workers shape bricks to build permanent homes for the widows. As the women see Chifene and friends lifting 50-pound bags of rice and beans from their van, the older women break into song and dance, and hug each arriving visitor. “Nzibongile!” (“Thank you” in Xitswa), they shout as each parcel of tea, soap and food is unloaded. 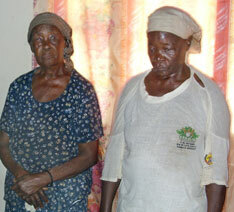 Juaneta, a quiet, 70-year-old, has been elected leader among the widows. “If not for the church, we would be dead,” she explains to visitors and friends. “They (United Methodist women) fed us and cared for us when we were abandoned, and now the church is giving us a way to support ourselves and live on our own. “Bless you,” she says, grasping Chifene’s hand. Later, Chifene and Mozambique Bishop Joaquina Filipe Nhanala reflect on the importance of the church’s investment in women. “When we help women, we help our nation,” Nhanala says. We invite you to join the dialogue. Share your comments. The bishop expects such investments to continue. “Whether it is micro-loans, caring for old widows or supporting education for girls, we have learned that our investment in women is a sure way to build our church and to build Mozambique,” she says. *Burton, who visited Mozambique in December, is the top executive of the United Methodist Commission on the Status and Role of Women.